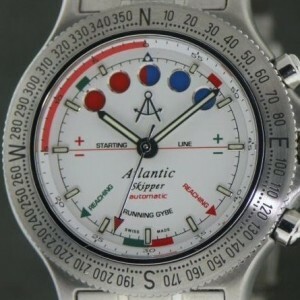 The Atlantic watch company was founded in Bettlach near Grenchen, Switzerland, in 1888 by Eduard Kummer. He was one of the founders of Swiss horology. 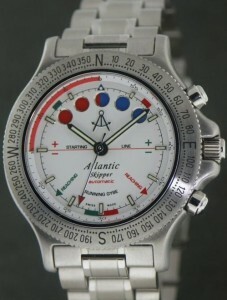 The company was originally called EKB (Eduard Kummer Bettlach) and later, in 1930, renamed Atlantic. 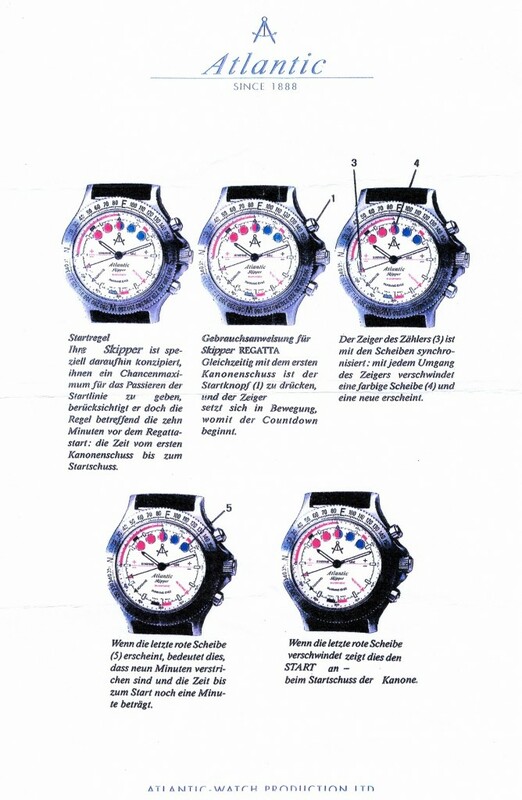 Eduard Kummer became a qualified master of horology and under his guidance the company grew quickly. Each Atlantic watch is equipped with a Swiss movement, and mid 1980’s the Atlantic Skipper was introduced, with a Valjoux 7757 movement. 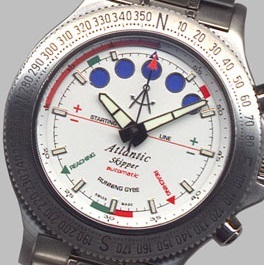 Atlantic Skipper with diver bezel, compass bezel or tachymeter bezel. Reference: 9505.41.12. 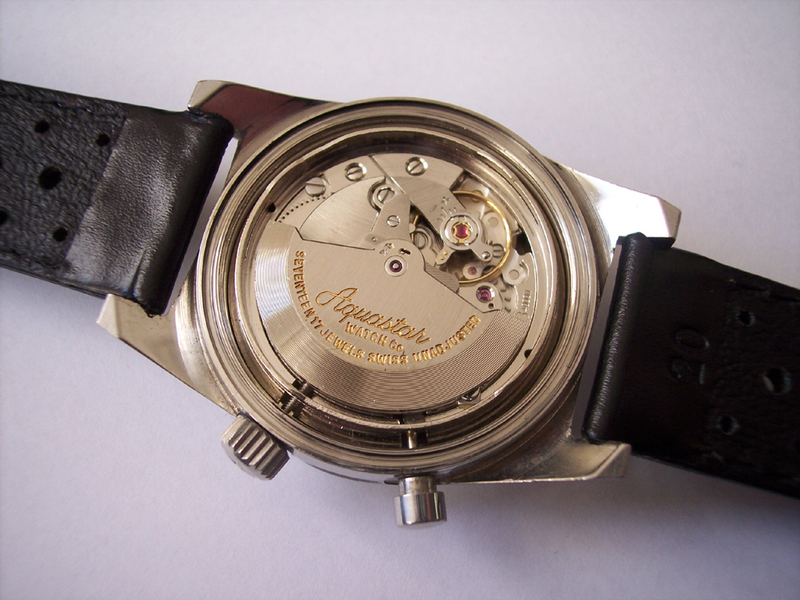 All watches are engraved at the caseback with an individual number (eg. 723). 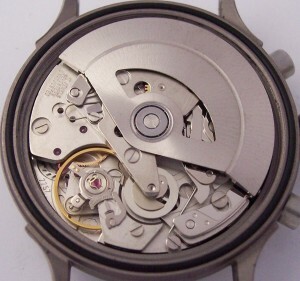 Caliber: automatic Valjoux 7757 movement. Case size: Ø 41,2 mm / H 14,3 mm. Year: 1985-2003. Sold out since 2004. 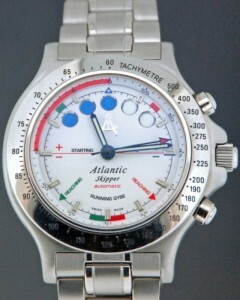 The regatta caliber 7757 has the crown to set the time at 3 o’clock, and two pushers for the countdown function. 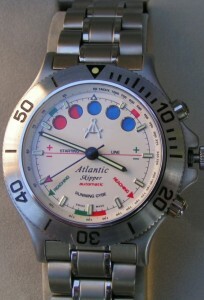 One pusher at 2 o’clock for start/stop and one pusher at 4 o’clock for reset. 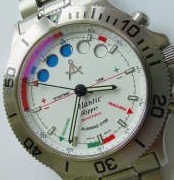 Under the dial lays the indicator disk coloured blue, white and red. 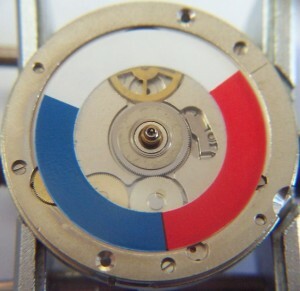 There are five round apertures cut out of the dial, between 10 and 2 o’clock. After a reset the five dots colour blue. When the chrono is activated the countdown starts and the sweep hand is set in motion. The indicator disk runs continuously clockwise. After one minute the first dot colours red, and after five minutes all 5 dots colour red. Again one minute later, so after 6 minutes, the first dot colours white. And after 10 minutes all dots colour white. 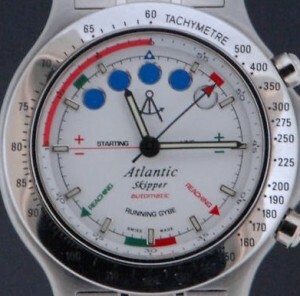 Unless you push the stop pusher, the indicator disk doesn’t stop revolving. After another 5 minutes it’s coloured blue again, and so on. So the regatta countdown function can be used for a 10 minute start as well as for a 15 minute start. The Valjoux regatta caliber 7757 is a modified caliber 7750, with a 15 minutes regatta module from Dubois-Dépraz integrated. Production period from 1985 until 2003. Only 300 copies have been made. A comprehensive description of how the Valjoux 7757 regatta movement works is written by Richard Askham on his website, see here, and you can download part of the technical documentation here. Instruction sheet, delivered with the Atlantic Skipper. 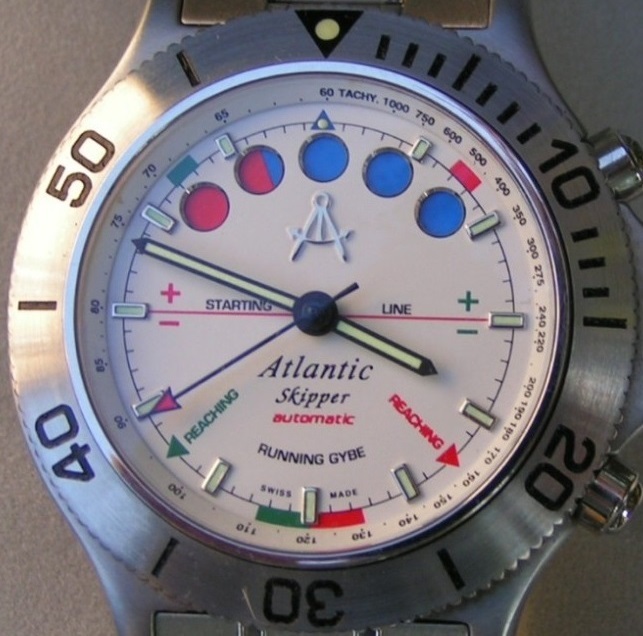 Type I, with the diver bezel and a tachymeter or 60-seconds inner ring. 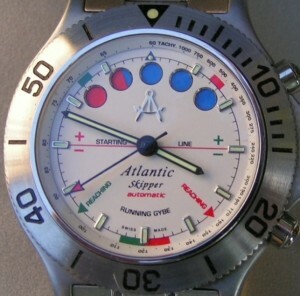 Type II, with the compass bezel and slim or thicker hands. 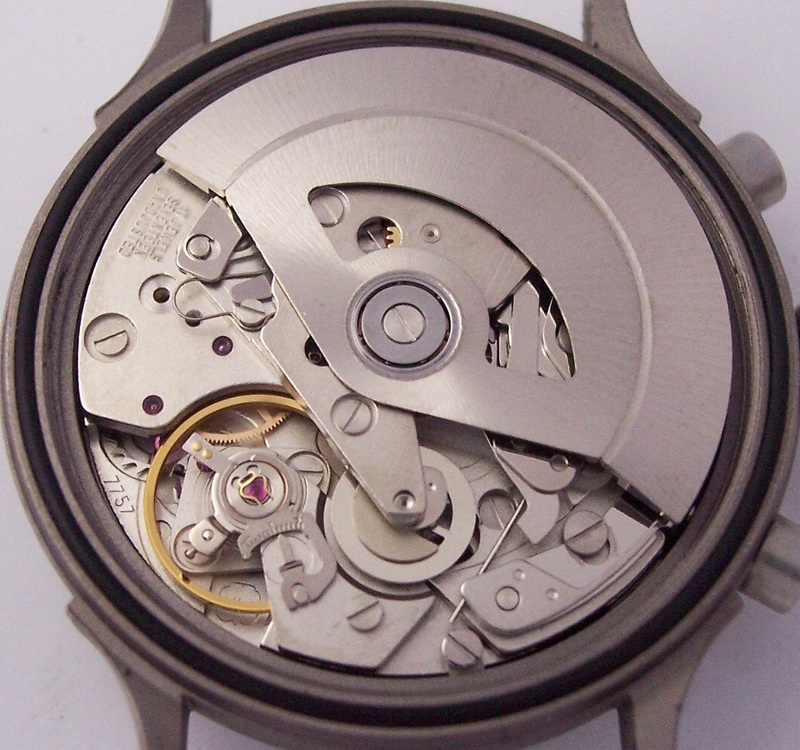 Type III, with the tachymeter bezel and a 60-seconds or an unmarked inner ring. It is not unlikely that other combinations have been sold as well. Sofar I haven’t seen them. If someone can shine some light over this, please get in touch with me through the Contact page. Many thanks to Jürg Bohne of Atlantic Watch AG for your information given by e-mail. 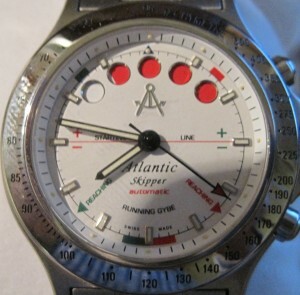 The History of the ATLANTIC Brand, written by Wojciech Kutermankiewicz.